Inspired by the artistic heritage of Italy, this Roberto Coin bangle possesses a unique beauty not bound by time or place. 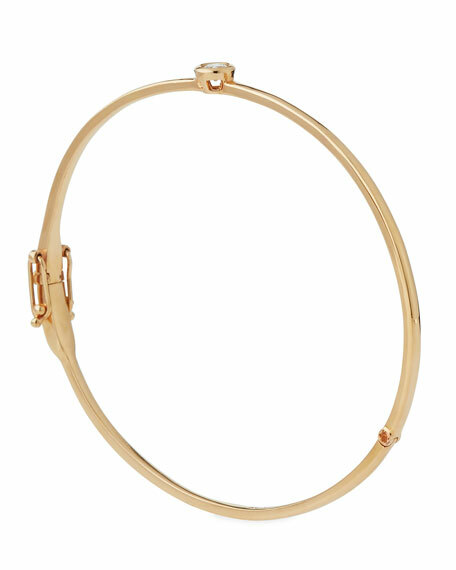 With a fluid sensibility and a glittering diamond center, this bracelet transitions beautifully from desk to dinner. 18-karat rose, yellow, or white gold. Hinged; push-clasp with small security latch. Dark horn bangle with stones by Ashley Pittman. African dark horn and hand-inlaid bronze hardware. Bezel-set round, oval and marquise-cut semiprecious stones. Ruby, carnelian, smoky quartz, amethyst, pink tourmaline, orange zirconia and rose quartz. Slip-on style. Handcrafted in Kenya.